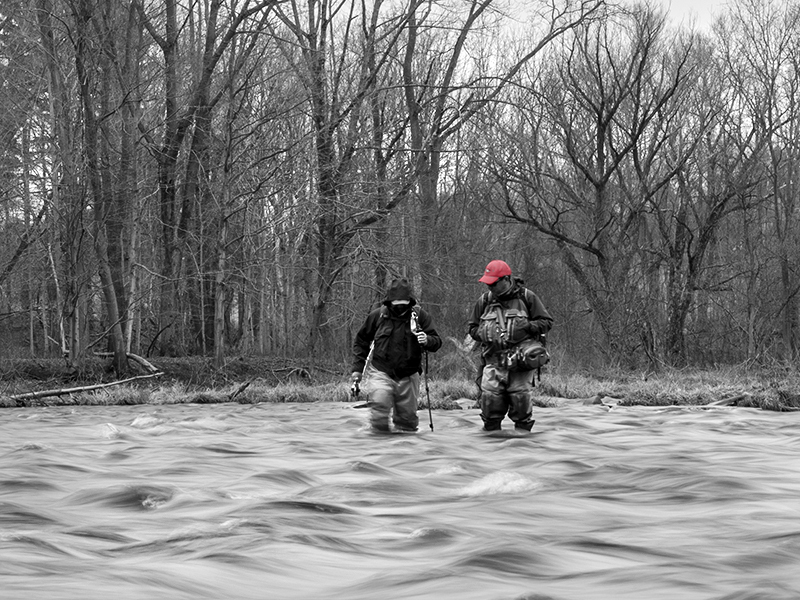 Steelhead fishing during the second week of December on the Salmon River in Pulaski, New York, means wearing layers of synthetics, fleece and wool--stuffing ourselves into boot foot waders and standing knee-deep in water so cold that it’s painful when you had to reach in to release a fish. And you knew you had to stick your hands all the way in because if you tried hoisting the fish out you would freeze its gills in the frigid air. But this year was different. A weather anomaly was sweeping across the northeast and the problem was not how cold it would be but whether the fish would be biting when the thermometer hit 60 degrees. 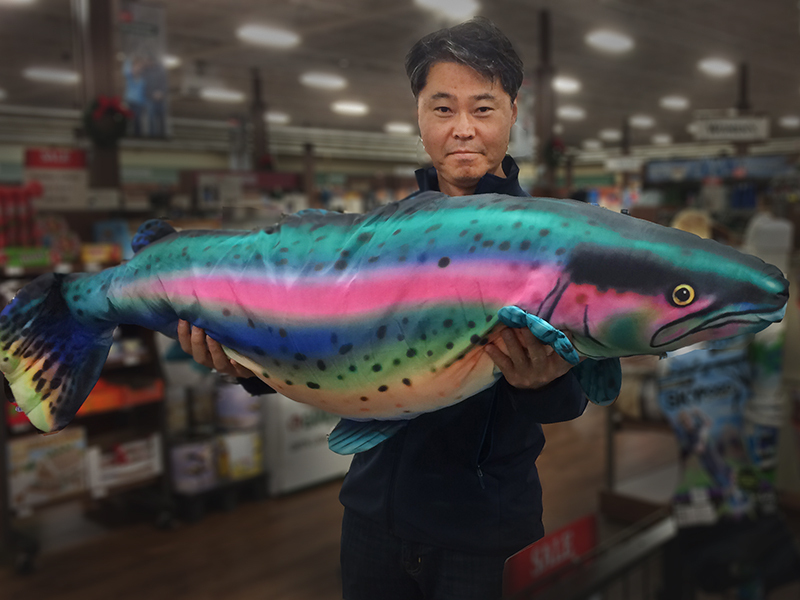 Jin and I were only fishing for one day so after swallowing a quick breakfast at the Tailwater Lodge in Altmar we met Greg Liu, our guide and owner of Oswego Outfitters, at Whitaker’s Fly Shop at 7am to gear up and head out to the Douglaston Salmon Run. Lunch was instant Korean spicy noodles with an egg. It tastes great when the temperature is hovering around 30 degrees instead of 59. We did a lot of fishing. And we also did a lot of hiking up and down the Douglaston Salmon Run, stopping to fish areas that had produced steelhead during past fishing trips, but with no luck. I swung the fly in small increments through deep slots and glides that Greg pointed out, chopping the water up into little sections, making sure my presentation thoroughly covered the water. I threw everything in my box but only managed to get lots of knot tying exercise after getting snagged a lot on bottom debris. With the fishing being so slow we had time to discuss the latest news in Pulaski--the possible sale, or loss of access, by the Douglaston to some very productive sections of the Salmon River. 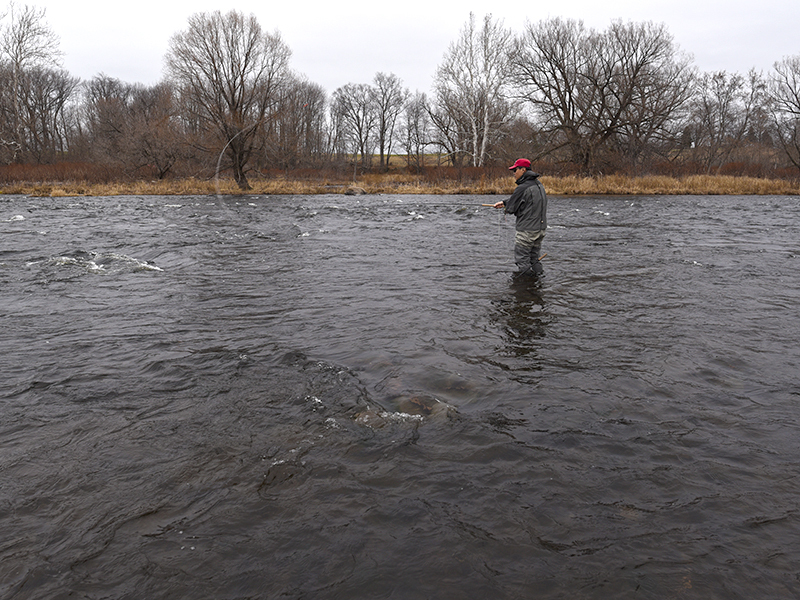 The DSR is situated on the lower Salmon River which is a prime fishing location because the salmon and steelhead enter here first when they begin their yearly migration from Lake Ontario. The Barclay family, who run the DSR, owns 29,000 feet of shoreline along the river but they also lease about 6,300 feet of riverfront from two property owners, David and Mary Gregg of Syracuse, N.Y., and Randi and Dean Joss of Pulaski. A lease has been signed between the parties for 2016, but after that it’s anybody’s guess as to what will happen. For those who fish the Salmon River and the DSR, the properties in question are located next to each other and stretch from the famous Joss Hole, just a bit downstream from the DSR parking lot, and ends at the estuary. That’s a lot of riverfront in play after 2016. Jin and I continued to toss flies but it just wasn’t happening. Egg patterns in various colors, styles and sizes. Woolly buggers, nymphs and pink worms. Bobbers and a ton of lead to get down followed by no bobber and no lead on a long leader. It was really tough. Other anglers would walk past with a vacant, distant stare, and ask, “Any fish? Anything?” Nope. Sorry. Enough talking. Keep on fishing. At the end of the day the tally was one strong tug and break-off for Jin and The Skunk for me. I lost a lot of flies, but I gave it the best effort I could and threw everything I had at the fish. But that’s fishing. Sometimes it’s great and other times not so much. But if you know you gave it your best, you really can’t complain because there are worse things I can think of than spending a day on the river fishing with good friends. DIRECTIONS: From Virginia just follow I-81 for a seven hour drive north to Pulaski, N.Y., which is about 30 minutes outside of Syracuse. EQUIPMENT: We used single hand, spey and switch rods with steelhead, skagit or mid-belly lines, sink tips, heavy leaders and a variety of egg patterns, streamers, and nymphs from size 2 to 12.